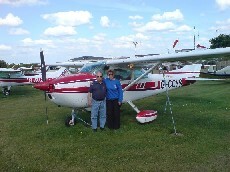 Sheila Dyson flies her Cessna 182 to Sydney, Australia from Netherthorpe near Sheffield. An aviation trip of a lifetime and a real adventure. A truly great accomplishment by any standards. Listen as Sheila shares her experiences of the trip to Oz.